Evelyn finally reached that big milestone of walking a little over a month ago and whilst she is still a little wobbly she loves to walk everywhere. Now she is on the move she loves pushing things along and taking her teddies on walks is great as it seems to steady her much more and gives her lots of confidence. So when we were given the chance to try out the new Fisher-Price Princess Walker we jumped at the chance as I knew Evelyn would love it, and I wasn't wrong. The princess walker is perfect if your child is learning to walk right up until they are confidently walking, the wide, sturdy base and easy grasp handle are just right for little toddlers. As I mentioned above Evelyn is already walking but this is still helping her grow in confidence, speed and stability. The Fisher-Price princess walker is great for developing motor skills and also encouraging role play scenarios. Evelyn is a huge fan of this baby walker and she loves pushing around her dolls and teddies around in it. 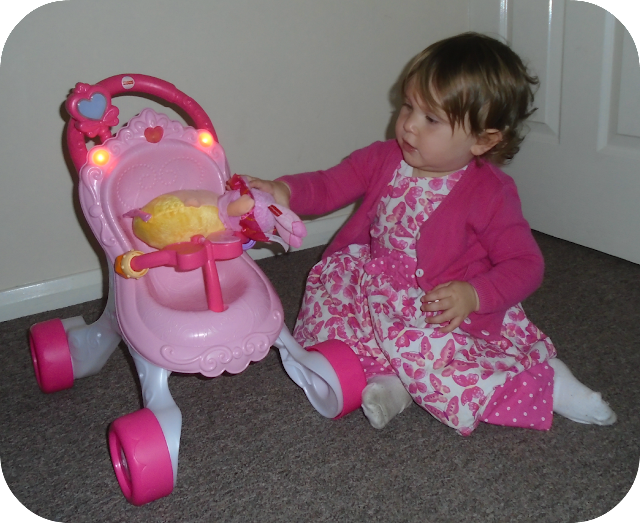 The princess walker also has the added feature of music and lights! With a simple press of the heart shaped wand at the top it rewards your toddler with magical sounds and lights along the top of the walker. Evelyn loves this added edition and happily bops her head and wiggles along to the music as she strolls along. To run the music the walker requires 3 AA batteries which are not included and has 3 settings - off, on quiet and on loud. 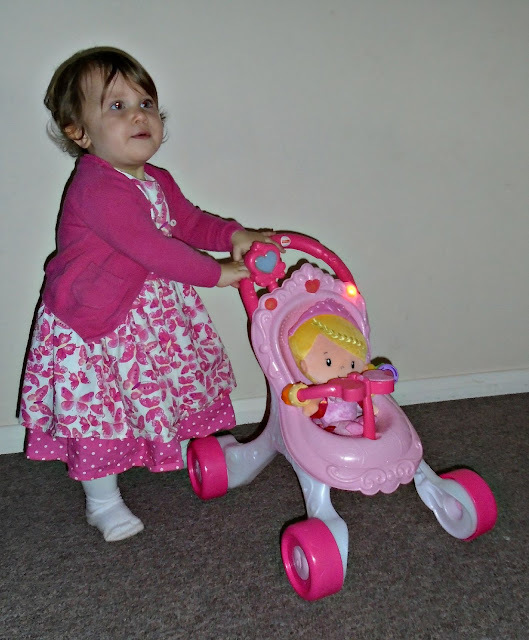 We are giving the Fisher-Price princess walker a huge thumbs up! This has been one of Evelyn's favourite toys since it came out of the box. It seems to be really well made, strong, sturdy and built to last as with all Fisher-Price products we have tried. Evelyn has pushed this indoors and outdoors on all different surfaces and it still looks as good as new. 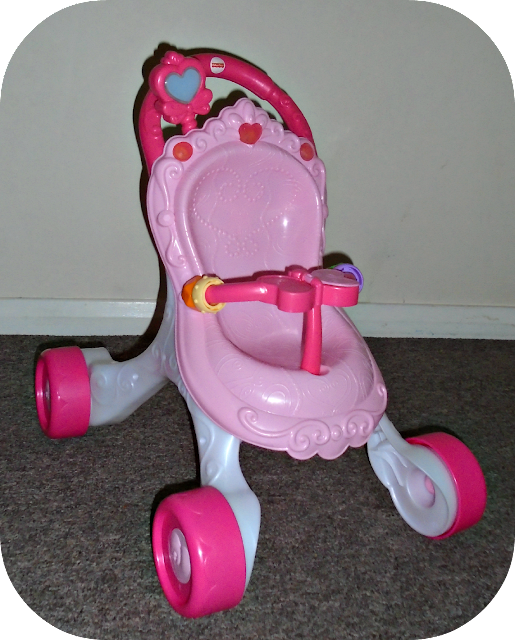 The Fisher-Price princess walker is suitable for ages 9 months + and is priced at £34.99. The Fisher-Price princess doll which you can see in the pictures above can be purchased separately and is priced at £9.99. Stockists include Smyths, Toys R Us, Argos and Amazon. If you want to know more about either product of more products from the range you can visit the Fisher-Price website here - www.fisher-price.com. This really does look great. It's pretty cheap too. Shame it doesn't come with the doll for that price though. I love Fisher Price. FAbuloius toy and so practical too, easy to clean and a lot going on to keep little ones amused. Fisher Price make such good stuff, always good quality and long lasting. The walker looks great and what a clever little girl!